Obstkuchen and Obsttorten, translated as "Fruit Cake," are cakes topped with fruit. Obsttorten refers to cakes that are made with a pre-baked base then topped with fresh or canned fruits (similar to fruit tarts). Obstkuchen refers to cakes that are baked with the fruit. There are hundreds of varieties of Obstkuchen and Obsttorten - all kinds of fruits or combination of fruits can be used. 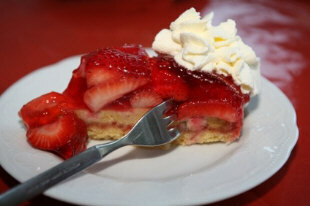 These cakes are very simple to make and, because of this, are favorites throughout Germany. Plus, any fruit combination is possible, satisfying all palates. The base of these cakes can be made from a yeast dough, a sponge cake, or a short dough (one that is easily rolled out). The base is typically thin. Depending on the fruit and other ingredients used, the base may be pre-baked without the fruit or baked with fruit. Those cakes topped with fresh fruit are also often topped with a clear glaze. This keeps the fruit fresh longer as well as adds beauty to the cake. Serve these cakes with fresh whipped cream and a good cup of coffee.